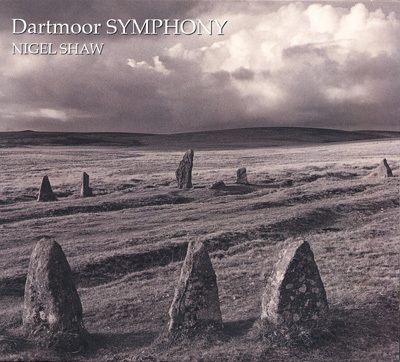 Nigel Shaw - Dartmoor Symphony - CD & DVD - New! This album is very special new work that forms part of a series of compositions based on the Dartmoor landscape and which, at last, an opportunity to hear Nigel’s music performed within a live orchestral context. The Dartmoor Symphony is a profound expression of the extraordinary beauty and power of this ancient landscape, drawn from many years of intimate connection with the moors and a constantly evolving journey into how the voices of nature can be expressed through traditional, classical and indigenous instruments. Echoing some of the musical themes and melodies from both of his previous works, Dartmoor Journey and Dartmoor Roundhouse, Nigel has developed the music into a richly textured symphonic composition that describes the landscape, and our human relationship within it. A sense of journeying, yearning, returning, and belonging are central to the feeling of this work as it travels through the five movements of Overture, Stone, Wood, Water and Sky. Nigel handcrafted a special set of Dartmoor yew wood flutes especially for this project and these unique instruments are constantly woven through the music. Each of the movements also includes instruments made from the raw materials and elements of the land such as granite grinding rocks, wooden bells, water-filled bowls and air chimes. Also featured are traditional whistles, small pipes, fujara, overtone flutes, piano, harp, celeste, bell, bowls and other percussion. Vocal parts are sung by Carolyn Hillyer. The string parts for the Symphony are performed by members of Ten Tors Orchestra, conducted by Simon Ible. Ten Tors is a chamber orchestra with a membership of up to 50 professional players, including a seventeen-piece string ensemble plus flutes, oboes, clarinets, bassoons, horns, trumpets, percussion and harpsichord. All the members are recruited from the south west region of Britain and many of them play with leading national ensembles including the Academy of St Martin-in-the Fields and the English Chamber Orchestra. This double album includes the DVD of an exquisitely beautiful film by Dartmoor photographer and film-maker Chris Chapman, assisted by Kate King. Created and produced with Nigel, the film is a journey through all the seasons in the Dartmoor landscape, moving from close abstract images of wild nature to the wide, expansive open hills. The film has been created to flow seamlessly alongside the Symphony: both a visual reflection of the music and a symphony of images. Chris Chapman has been documenting and archiving all aspects of Dartmoor life since moving here in 1975. His photographs reflect the truly authentic nature of these moors and its people. Both CD and DVD are one hour each.